If you are looking to setup your first website, or you already have a website, you may know that there are 2 things you must have; a domain name and web hosting. This is something clients ask me all the time. And I get it – it’s not very clear. Domain names and web hosting can often be confused as being one and the same thing. But they are quite different! Let’s have a look at what they are and their differences. How Do I Purchase Web Hosting? But What About the WWW Part? Don’t I need that? So How Do I Purchase a Domain Name? A domain name is the address you type into your search bar on your browser (such as Google Chrome, Mozilla Firefox or Internet Explorer). For example, if you wanted to browse to Amazon’s website, you would type amazon.com into your browsers’ address bar. A domain name is a human-friendly address that tells your browser which website files to load. Hang on – a website has files? Oh yes! Again, I will get to that shortly. Underneath the friendly exterior is a sequence of numbers and decimal points that is unique called an IP Address. It looks something like this: 66.123.456.23. Your web hosting server is set up with this IP Address and the domain name is configured to point to the IP Address, thereby linking the two together and telling the browsers where to go to find your website. Human’s find it hard to remember long strings of numbers so domain names were invented to make things easier! Think of your website as a house. You want to attract visitors to your house but you need to give them an address. So you go and register your address, something like myonlinehouse.com. Now you have an address! But you also need a house and you need somewhere to put it. So you’re going to need a plot of land to put your house on, or – web hosting! Your website is going to be made up of lots of files and folders, just like the documents and files you have on your computer. But you can’t store your website on your computer, you need to store it somewhere else where lots of people can visit it at any time, day or night 24/7/365. So you need to rent a plot of land, or online storage. Web hosting companies rent out storage space for you to put all your website files in and they do some super technical wizardry to enable the storage space to be accessible by people all over the world. They assign an IP Address to your “plot” and then all you need to do is point your address (domain name) at that plot. Then when someone types in your address into their browser’s address bar, hey presto – they can load your website! There are lots of different options for web hosting out there. Choosing the right plan for your website is important. Prices and options vary significantly depending on what you need. The bigger your house, the bigger the plot of land you require (disk space). The more visitors you have, the more parking spaces you need (bandwidth). There’s also security, backups speed and uptime to consider. If you’re using WordPress, we recommend choosing one of our Managed Service Hosting Packages which include all of these features and more. Contact us today to enquire. You can choose whatever you like for your SLD, so long as it’s available. You can use any sequence of alphanumeric characters (a-z, A-Z, 0-9), hyphens or words — but no spaces. You are more restricted in choosing your TLD as there are a finite amount of varieties but more and more are being created and released all the time. Popular TLDs include .com, .co.uk and .org but you can get all sorts of TLDs such as .biz, .xyz, .online and more. Your domain name is created by combining your TLD with your SLD. Choosing the right combination for your website is another challenge altogether and I’ll be writing a separate post for that soon. Keep an eye on our blog and social media! You can pretty much dispense with the www. and the http:// part of the address. Modern browsers will figure out the http:// or https:// part automagically and the www. part can just be assumed. What is shown in your address bar will be dependent on how your website and domain are configured. So now you know the difference between a domain name and web hosting. Now you need to get your domain! Domain names are generally purchased in bulk by Domain Registrar companies and then leased to people on contracts with annual term lengths. You generally don’t own a domain name, you lease it. I recommend using GoDaddy. They have a huge selection of TLDs and SLDs available and they offer good prices. 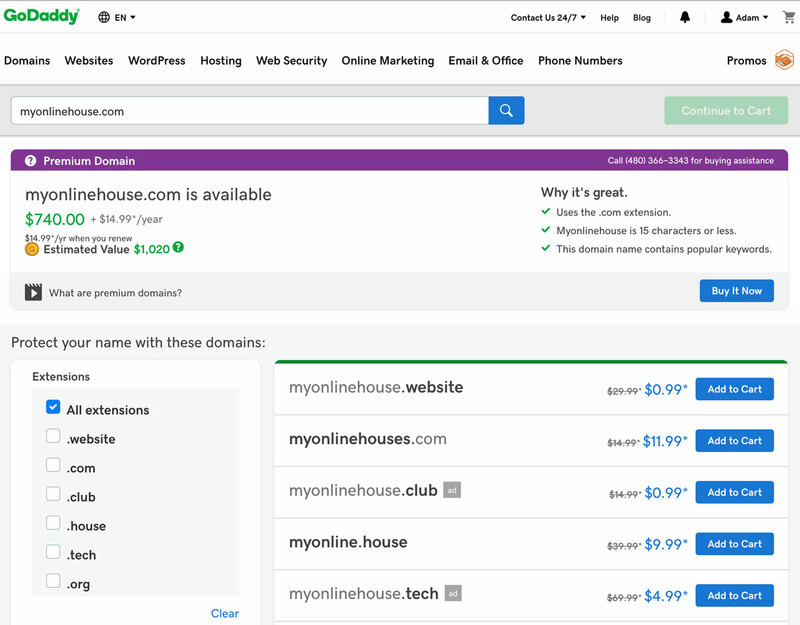 Some of their domains can be leased from as little as $0.99 a year! Just keep in mind you don’t need to purchase all of their additional add-on options. Try changing your TLD and SLD combination until you find a domain name that is available and suits your budget. If GoDaddy doesn’t own the domain, that means another domain registrar owns it and you will need to search around a bit to find the registrar that can supply it to you. If someone is already leasing the domain, they might be open to transferring it to you – at a cost! People make a lot of money buying and reselling domain names and you may have to pay a premium to obtain the one you want. Sometimes it can be worth the cost. 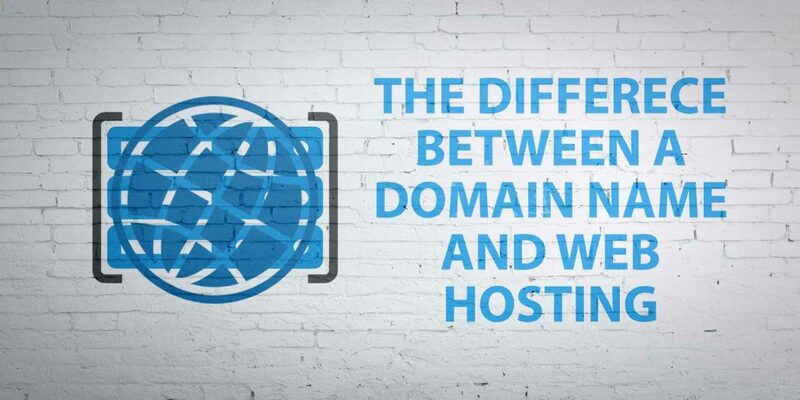 Hopefully this has clarified the difference between a domain name and web hosting for you. If not, feel free to contact us for advice or a free consultation on your website requirements. We’d be happy to help! 9 Reasons Why You Should Use WooCommerce For Your eCommerce Website Why Is Page Load Speed Important?